Michael Ableman, the cofounder and director of Sole Food Street Farms, is one of the early visionaries of the urban agriculture movement. He has created high-profile urban farms in Watts, California; Goleta, California; and Vancouver, British Columbia. Ableman has also worked on and advised dozens of similar projects throughout North America and the Caribbean, and he is the founder of the nonprofit Center for Urban Agriculture. He is the subject of the award-winning PBS film Beyond Organic narrated by Meryl Streep. His previous books include From the Good Earth, On Good Land, and Fields of Plenty. Ableman lives and farms at the 120-acre Foxglove Farm on Salt Spring Island in British Columbia. Caryn Hartglass: Hello, everybody. I’m Caryn Hartglass and it’s time for It’s All About Food. You know how much I love talking about food, and this is going to be another great hour talking about my favorite subject: food. I can’t wait to get started with my guest. But first I want to take a moment like I typically do. Thank you for joining me, thank you for tuning in love because that’s what this show is really about. It’s about love and all the good things that we can do on this planet, our home Earth. I love autumn, and we’re really into autumn right now in New York City. I’m looking out my window: the leaves are turning colors, the air is so fresh. I’m enjoying the coolness, wearing a sweater finally. It’s beautiful, and I’m grateful for all of that. I’m really looking forward to speaking to my guest Michael Ableman. He’s the co-founder and director of Solefood Street Farms. He’s one of the early visionaries of the urban agriculture movement. He has created high profile urban farms in Watts, California; Goleta, California; and Vancouver, British Columbia. He has worked on and advised dozens of similar projects throughout North America and the Caribbean. He is the founder of the nonprofit Center for Urban Agriculture. He is the subject of the award-winning PBS film Beyond Organic narrated by Meryl Streep. His previous books include From the Good Earth, On Good Land, and Fields of Plenty. He lives and farms at the 128 acre Foxglove Farm on Salts Spring Island in British Columbia. We’re going to be talking about his new book Street Farm. Hi, Michael. How are you today? Michael Ableman: So nice to be with you. Thanks for having me. Caryn Hartglass: You’re very welcome and I am so honored to speak with you. I read a lot of books, especially for this program, and I’ve come to realize that my favorite books are the ones like yours: about farming, growing food, and doing it the way—I don’t even know how to put this because your way of farming is just so in-the-box—but growing food organically with passion, with care, with focus, with love. And creating something nutritious and delicious, and building so much more other than just a meal on our plate. I love stories like that, I loved your book, I love your story, and I want to talk as much as we can in the next half hour about it. Michael Ableman: Oh, thank you. Caryn Hartglass: (chuckles) Okay, so I don’t know how you were raised, but I love the idea that you felt this need to create something that not only was something you believed in, but you were creating a business that was employing people that are normally unemployable. Michael Ableman: That’s correct, yeah. Mm. Caryn Hartglass: Yeah. So where did you find that in yourself to do something like that? Michael Ableman: (chuckles) Well, Caryn, I’m sixty-two years old. I’ve been farming since I was eighteen, commercially. Primarily in more traditional farms that people would see in their mind’s eye if they thought, “farm”. But I have felt in recent years the pull to use my skills that reached out to folks who either did not have access to good quality fresh foods or to jobs, to meaningful work. Individuals who were on the fringes or on the edges. We started this project Solefood Street Farms about eight years ago in a neighborhood called Downtown Eastside, which is a neighborhood where the term “skid row” was coined. We employ twenty-five people, all of whom are managing some form of long-term addiction or mental illness. I have to say that when I first visited that neighborhood, I came to that neighborhood with the same preconceptions and judgments and prejudices that I think we all do if you see somebody on the sidewalk with a needle in their arm or somebody else pirouetting in the middle of the street high on crack. You make judgments; we all do. Michael Ableman: But I have since discovered that those same individuals have incredible amount of creativity and intelligence, and a desire to do something meaningful in the world. And all that we did was kind of set the table and provided a place for them to have a meaningful engagement. It’s really simple. We’ve done that through large-scale urban agriculture production on parking lots through an innovative box system. We produce twenty-five tons—that’s fifty thousand pounds of food—annually. Remarkable on four plus acres of primarily parking lots and paved land. Michael Ableman: And we do it with the hands of individuals who were previously considered to be unemployable, as you mentioned. Now many of whom are highly skilled and wonderful farm workers. Caryn Hartglass: I’m just getting all teared up thinking about it because this is a beautiful thing. Right now, our mainstream media, especially here in the United States, is crammed with all this political trash and garbage. People just getting all emotional and angry about nonsense. And here is a win. Now you said it was simple. I don’t know that it’s necessarily simple because your book definitely goes into the challenges that you’ve experienced. But we can all make a profound difference by getting our hands dirty, for one. Most people that I associate with a lot on a regular basis want convenience. And if we could just push our limit a little bit. I just found your book so inspirational, and I would hope that it would inspire people to get their own ideas. I live in New York City, and I remember visiting Vancouver a number of times. It’s a beautiful city. I only saw the modern, touristy, kind of beautiful spaces. I wasn’t looking in some of the places that you have described, and I don’t think I’ve been there in the last few years when your farms have been developed. So I haven’t had an opportunity to see them. But there’s such a vast gap between the privileged and the non-privileged. Our current system wants everybody to fit to a certain mold, and clearly we don’t, even in our school systems. There are many people who have abilities if they could only be nurtured by someone like yourself and your peers, and give them a chance. Such a beautiful story. Michael Ableman: Yeah. The story that I tell in the book Street Farm is a story of what we’ve done in what is the poorest neighborhood in anywhere in the country. But it’s also an emblematic story. It’s a story of what could happen anywhere. Currently, we have epidemic levels of opium addiction and now, in recent times, very high levels of overdose. The issues that we face in Downtown Eastside, Vancouver are similar to those that exist elsewhere, but Downtown Eastside is an extreme example, certainly. When I describe our approach as “being simple”, I’m suggesting that the idea, the concept, the means by which we reach out to people is simple. The technical parts of it were complicated. Michael Ableman: But when people have something meaningful to do, a reason to get up out of bed each day—when they have a choice that they can make between something that’s going to continue to bring them down and something that might lift them up; a community of people that depend on them; plants that rely on them daily for attention in order to survive; neighborhoods that need food that’s being produced from those plants—all these things help to inform someone’s ability to lift themselves up and participate in a meaningful way—even if it’s for half a day—to step out of their addictions, out of their challenges, and feel a little more sense of pride and accomplishment. I think that’s the simplicity of this. We’re not social workers, we’re not addiction experts, we’re not psychologists; we’re farmers that have provided the space for people to come together. The results of that have been rather profound, as I write about in the book. I profile a lot of the individuals that we work with and it’s pretty amazing. Caryn Hartglass: Many of us have acknowledged that there’s this big disconnect today in our current society: a disconnect between where our food comes from, especially in our environments, and a disconnect between the other living species (animal and plant species) on this planet. There’s a big disconnect. It’s a very healing thing when we reconnect with everybody else we’re living with and sharing on this planet, be it plants and non-human animals. It’s just really exciting to see. We see urban farms; there’s plenty that are starting to happen in New York City and it’s a great thing. I was meeting my parents yesterday for a little family lunch in a neighborhood around where I grew up. I took the train and walked to the big mall where we were meeting. And I walked through a somewhat depressed town; it was never an affluent town as I remember it and it looked really beat up. But I was halfway through your book already, and I passed numerous paved, fenced-in lots where some weeds were growing. All of a sudden, I was filled with hope that I didn’t have before because I saw them as farms. I thought, “Oh! Someone could plant a whole bunch of stuff right here!” and “Oh! There’s another place right here!” ‘Cause you talked about how great these paved areas were for farming. Michael Ableman: Yeah. In the early 1980s, I had been visiting a number of urban communities, primarily low-income communities in the states where I am originally from. And there were a few things that I noticed. One was that there was very little access to fresh food. Most of them had been a major supermarket’s slight for those neighborhoods. The only food that you could have found might have been at the liquor store or 7-Eleven. Michael Ableman: The access to work and jobs were really lacking, especially meaningful jobs. At the same time I witnessed all these abandoned lots like what you described. I thought, “My gosh, if we could use those lots, we could provide and create working enterprises to provide employment for folks and to provide food for folks.” And not in a garden scale. What I had always focused on was on a production scale, something that can really produce a lot of food and a lot of jobs. So yeah, I did projects in places like lots and Los Angeles. I was there when Rudolph Giuliani was threatening to auction off all those community gardens way back when, and then I gathered together some well-known people (David Bauer, Alice Waters, and other folks) and we rallied some energy around that. Was felt for some time that this idea of urban agriculture was more than just gardening and it was more than just about food. In those days as well, if you used the words “urban” and “agriculture” in the same sentence, you were looked at a little bit strangely. When we started that Center for Urban Agriculture, it was certainly well before there was a movement around this. Michael Ableman: But I have since witnessed some really wonderful, creative work getting done. My friends at Green Gorilla in New York City and other projects there, and certainly all over the country are just coming up with some amazing, innovative, and creative ways of bringing this energy into the urban areas. And it’s pretty exciting. Caryn Hartglass: I wanted to quote a few things that I loved in the book first, to sum up what you just said. And I’m going to quote you from your book. “We can march on Wall Street, or we can continue to work quietly and diligently in rebuilding the real economy, the one based on soil and sunlight and people working together to grow food.” So beautiful. Thank you for writing that. 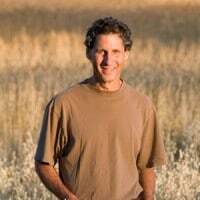 Michael Ableman: Yeah, that was something that I had written post 9/11 for a speech that I gave for the Bioneers Conference in California. Basically, I was questioning what is patriotism, and I think it depends on your view and definition. In that same speech, I proposed to memorialize those who lost their lives in the World Trade Center, that we consider a living memorial: an urban farm complete with greenhouses, orchards, and production crops on the side of the former World Trade Center to celebrate local economy as much as had been previously. On that same side, as much as the global economy has been celebrated. It was interesting that a couple of organizations including Green Gorillas got behind that idea. It was submitted as one of the memorials. I had no illusions that it was going to be taken seriously. (chuckles) But I think that we need to really be willing to step out and propose things that are somewhat outrageous. Because what’s going on the other side is somewhat outrageous. I’ve been watching the presidential campaign and some of the regional campaigns in the US for political office, and I cannot think of one time where I’ve heard a single candidate say anything about food or farming. Very little about environmental issues; it’s hardly ever mentioned. I know that there are regional candidates that are speaking out on these issues, but I can tell you: it’s been hard to find anything on that subject; and yet, what is more central, what is more basic to our survival, our wellbeing, our sense of community, our sense of culture than food? It’s the gathering place. It is so, so central, something that we all have to do every day. Michael Ableman: And one that is incredibly precarious. It’s remarkably precarious. The industrial system that’s bringing it to us is not a health system. It’s one of those things that I would hope would be addressed, but it’s not. Caryn Hartglass: It’s not, I know. I was recently at the EATx Conference at the UN a few weeks ago, when there were all the goings-ons at the United Nations, and I was very excited to attend. There were a number of speakers from all over the world—from the Netherlands, the northern countries especially, ‘cause the EAT Foundation is from Denmark, I believe—and I was waiting. I was waiting. People were talking about how we needed something radical and a revolution. They mentioned urban agriculture and how we’re going to need to grow more food to feed 9 billion people by 2050. And yet nobody ever said what we could do. They talked about addressing the waste issue, they talked about what we need to address access. But I felt that that was a lot of big vocabulary words and I didn’t really hear about any real action. It was very, very frustrating. Michael Ableman: Yeah. I mean, that’s one of the reasons that I wrote the book Street Farm because I think that what we attempted to do with this project in Vancouver is an interesting model and a potential inspiration for communities all over the place. Lots of obstacles, many difficulties. The book is not a fluff piece about all our successes. In fact, it’s incredibly honest about all the things that we’ve failed at, which I think in some ways is more informative. But it does present a blueprint for the possibility of successful, viable urban agriculture enterprises that also have the potential to serve those who are underserved. To reach out to folks both from an employment perspective and from a food perspective. If nothing else, if you read the stories of individuals in this book, you cannot help but be inspired by their courage, their perseverance, and by what we have actually achieved by their hands. It’s amazing. The wonderful quote at the beginning that I’m just going to read to you, it’s really kind of emblematic of the whole book and it’s from the film The Imitation Game. “Sometimes it is the people no one imagines anything of who do the things that no one can imagine.” I think that really says it all to a great degree. Caryn Hartglass: Yes, yes. We all have such great potential and so many people are just shoved aside. Caryn Hartglass: One of things I would love to see in our agriculture universities, for example—instead of focusing on genetically modified foods and all kinds of newfangled ways to make food, to concentrate on organic farming. To concentrate on how we might grow food in a vertical environment. You mentioned towards the end of the book growing strawberries, an exposition vertically, and you were challenged by it. Well, you know, people can figure out how to do that and do it well! Just need a little time, a little energy, some investment, of course, which is the big empty space in the equation. Because there needs to be money behind it. I don’t know, our priorities need to be seriously adjusted. Michael Ableman: (chuckles) Yeah. Well, there’s a lot of context around that statement, isn’t it? Michael Ableman: It’s rigged with a broader piece, but actually it’s true. People always laugh when I’m teaching them how to pick strawberries. You see these little, misshapen, terribly ugly strawberries. And I tell them, “Look, this will absolutely be the best one that you’ve ever had.” No one ever believes me until they taste it. It’s true. I think that I was kind of playing with that statement to some degree. I’m sure it’s not always true, but I have found in many cases it is physically true and more metaphorical in its use of language. Caryn Hartglass: There’s actually science behind it! Caryn Hartglass: There have been some studies with hydroponics and other studies. Oh, I’m getting all wound up here, but when plants have to work harder, they get stronger, more flavorful, and more nutritious. When we put pesticides and herbicides in the ground, the plants don’t have to work as hard to fight to survive. As a result, they’re not as nutritious and they’re not as flavorful. Caryn Hartglass: It’s fascinating. And you were talking about tomatoes too! When they’re exposed to very little water, they have to really struggle and then you get this really intense flavor! Michael Ableman: Yeah, dry farming tomatoes. Of course, there’s a long tradition of that. I’ve done it for many years; I did it when I farmed in California and we still do some of that here. The grape growers understand this concept very well. They know about the grapevines that are stressed and are held back, the quality of their fruit results. So this is a deep, long-held knowledge that we are all just rediscovering. Caryn Hartglass: Yeah, rediscovering. There’s just so much knowledge that we’ve lost with big agriculture that we absolutely have to rediscover. Now the unfortunate thing is that a lot of the urban land is contaminated. You talked about how even if you wanted to, if you were given a piece of land in an urban environment, you wouldn’t even want to grow there because it’s contaminated. So you came up with this solution of growing in boxes, and you had to figure out which ones were the best to grow in that would last longer and work the way you wanted to. But is there any hope of reclaiming the land that’s underneath all that pavement? Michael Ableman: Well, a friend of mine has always said to me that by paving over our precious topsoil, we are preserving it for future generations—somewhat jokingly. Michael Ableman: Look, most urban areas everywhere in the world, the native soil that exists under pavement, under buildings is extremely contaminated. It’s contaminated from industry; it’s contaminated from runoff. So especially for our older cities, there is just a long, long history of deposition contamination. Lead, asbestos, and industrial waste: you name it. All the way down the line. So it is completely unsafe and somewhat irresponsible to think that we can grow food directly in native soil in urban areas. I don’t think it’s safe. We would be hard-pressed to find very many places in most cities in anywhere in the world that are safe. We created a pretty innovative system for isolating the growing medium from either pavement or contaminated soils. It’s a box system that we have designed and fabricated. We have went through a lot of iterations, a lot of mistakes which I go into in the book. And now I have a wonderful approach to doing this: boxes that are stackable and nestable. They have interconnected drains; they can be moved by a forklift so they address the issue of short-term leases and high value urban land. Mostly, they keep the growing medium and the food plants from having any direct contact with native soils, and also allows to grow on pavement. That’s been a long process to come up with that solution, but one that I think would be helpful to people anywhere. Caryn Hartglass: Okay; now I’m going to be a little selfish. I don’t know if you have the answer to this question, but, as I mentioned before, I live in New York City; I live in an apartment. Occasionally, I’ve grown things on my terrace and recently we’ve received lemons from a cousin in California. The seeds were sprouting; the lemons must’ve been on the old side. But I couldn’t deny these seeds an opportunity to grow. So I have these lemon seeds in little pots. Do you have any recommendations? Do you think I can grow a tree in my apartment? Michael Ableman: Well, you can certainly grow a tree in your apartment. The lemon tree that will come from the seed of that fruit will not likely have any resemblance to the fruit itself. They will not grow true to their parent. Michael Ableman: In order to replicate that lemon, you have to do it vegetatively from cutting, grafting, and budding. Citrus is budding. So yeah, you could do it. In fact, the Meyer lemon is a lemon that grows remarkably well in a cold and cool environments. That’s actually one we grow in Vancouver, British Columbia. We grow Meyer lemons. Michael Ableman: So it is doable. You really have to think about protecting those plants, especially with New York in the winter. Michael Ableman: They’re not going to survive a New York winter outside or on your deck. Caryn Hartglass: Yeah, I know. They would have to be indoors. Caryn Hartglass: Anyway, the last thing I wanted to mention, you touched on it briefly. You talked about giving away food and not giving away food, and this idea like a Garden of Eden. I visit Costa Rica from time to time, and I go to these very undeveloped areas. When some fruits are in season, they’re just dropping everywhere. And it’s the most lovely experience where there’s just food to eat everywhere for no cost. You just take it when you want it, and it’s such a beautiful image. You touched on it lightly, but having this opportunity for all of us to eat just like that. Michael Ableman: That concept was brought up in the context of a broader conversation in the book, where I’m talking about encountering the homeless man who had climbed the fence to our large urban orchard that’s five hundred trees producing persimmons, pears, apples, quince, and Meyer lemons. All kinds of things like that. He was helping himself and loading up bags, essentially stealing. He told me that this was God’s plants and God’s food. I said, “Well, God had a lot of help from us in planting and growing this stuff.” When he’s stealing, he’s actually stealing from the very people whom are his neighbors and folks who are struggling just as he is. Because if he steals our food, we can’t sell it and pay their payroll. After that conversation, I reflected on that idea. In an ideal world, that orchard would have no fence around it. It would be open and accessible to anyone who needed to come in and enjoy not just the fruits off the trees, but the space itself. But we have to live within the realities of having to support the people we’re trying to employ. So it is an eternal dilemma that I struggle with on a constant basis. We would prefer to just grow everything and give it away. We aren’t able to do that. Caryn Hartglass: I wish more people struggled with that. I wish more people struggled with that concept; it would be a far better place. Michael Ableman, thank you for joining me on It’s All About Food. Thank you for writing the book Street Farm. I think it can inform and inspire so many people who might have a romantic notion about farming or just want to know more about growing food. Thank you again for joining me. Michael Ableman: Thanks so much for having me. Okay, all the best. Caryn Hartglass: Okay, take care. That was Michael Ableman, everybody, the author of Street Farm. You can find out more at solefoodfarms.com, and that’s sole: s-o-l-e. solefoodfarms.com. Okay, let us move on, shall we? We have some more wonderful guests, but before we get to them, I just wanted to mention—I talked a while back about the 2Forks Events with Dr. Esselstyn and his family. I know a number of you have gone to the one in Dallas and I wondered what did you think. Because there are some more coming up in Cleveland and in Arizona, and I think we’d like to know more about it. So if you’ve gone to any of those events and I know some of you have, let me know at inforealmeals.org. For those of you still considering those other events, you can get a $50 discount; real50 is the discount. Real50. Go to responsiblelivingandeating.com, my non-profit site, and find out more about the 2Forks Event. All right, let’s take a very quick break and we’ll be right back. And find out about the 2016 sexist vegans over fifty. I can’t wait.